Grab just nabbed an award for the OpenTraffic project – an initiative that helps Southeast Asian governments solve critical traffic problems. “Today, Grab won the PublicAffairsAsia’s 2016 Gold Standard Award for Public Private Partnership, considered to be the top honour in the public affairs industry. The award recognises Grab’s strong collaboration with Southeast Asian governments and the World Bank for the OpenTraffic partnership, which we officially launched in the Philippines this April. To give some background, the World Bank leads the development of OpenTraffic, an easy-to-use traffic data platform, provided for free to governments. Grab contributes our aggregated, anonymised driver GPS data to the platform, derived from the 34 cities in Southeast Asia we operate in. To keep this data secure, the raw GPS data never leaves Grab’s servers. The resulting traffic statistics are shown in real-time, providing an incredibly powerful smart data tool to governments. Simply put: Every Grab ride taken provides valuable data that could be used to fix transport problems affecting over 620 million residents in Southeast Asia. Each day, Grab’s fleet of over 500,000 drivers are criss-crossing roads, big and small, in Southeast Asia. Their Grab driver application produces GPS data, allowing us to collect a massive trove of information. 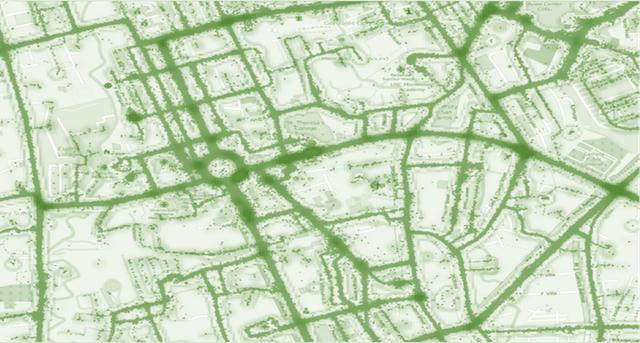 The data is so rich that when the GPS points are put together, they look like a map of the city. Now imagine if that information was converted into traffic statistics and shared with governments. City planners could use it to tackle problems common to Southeast Asia. Take, for instance, traffic jams which cost Asian economies 2% to 5% of GDP each year, according to the Asian Development Bank. With OpenTraffic, traffic authorities and city planners could use congestion patterns on roads to improve traffic signal times or route planning. Governments could then relay public announcements on the best transit routes and time to travel, saving drivers and passengers time and money. City planners could make better decisions on where to build road infrastructure, such as overpasses, resulting in a better return on public funds. Deevya speaking to Bloomberg TV Philippines about OpenTraffic in April 2016. Through OpenTraffic, Grab aims to work with government agencies and the World Bank to use our traffic data to solve traffic and road safety problems across Southeast Asia. The OpenTraffic partnership is a testament to Grab’s social mission to improve lives in Southeast Asia by enabling safer rides and increased access to affordable transport. On 5 April 2016, we launched OpenTraffic as a pilot programme in the Philippines, where traffic jams cost the country an estimated 2.4 billion pesos a day. OpenTraffic’s “map” of Davao City. The platform provides information such as traffic speeds. Today, Grab is working with our government partners in Manila to run impact studies on a new expressway designed to give quicker access to the Ninoy Aquino International Airport (NAIA). In September, authorities gave commuters toll-free access for a month to part of the expressway. Our OpenTraffic research uses Grab data to measure the impact of this toll-free policy on traffic jams and travel times. In Cebu, the World Bank has been using OpenTraffic to adjust traffic signal timings to ease congestion. 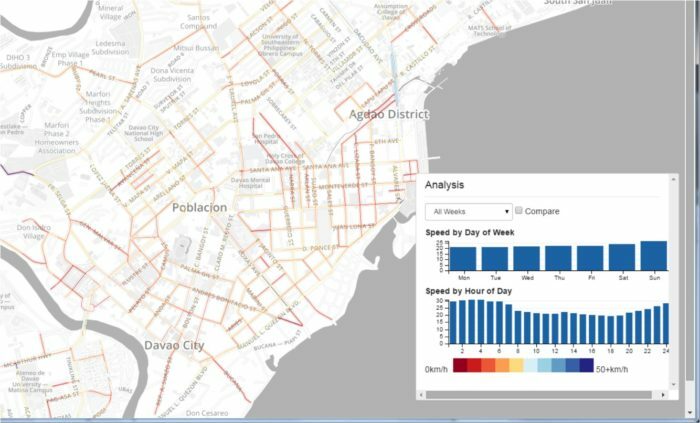 It is also working to combine OpenTraffic data with traffic accident reports in Manila, so emergency response units can be dispatched to accident scenes quicker.